My brother has several quilts now. 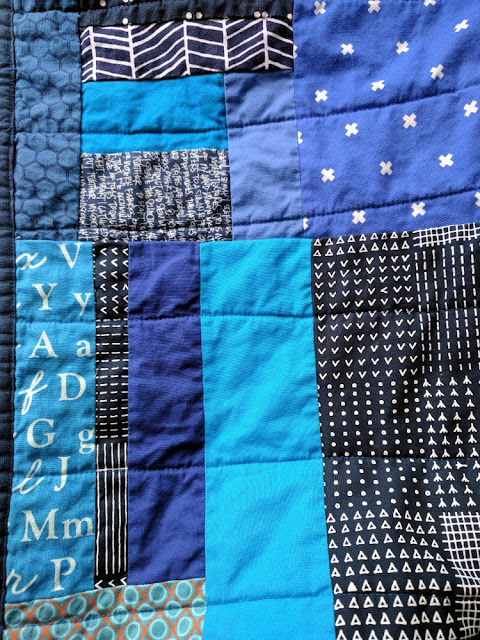 In the past, I made him a t-shirt quilt (actually, two different ones - the first was one of my very first quilts, and it was not made well, so I sewed another one later on). I also made him this custom Game of Thrones quilt for his birthday last year. His bachelor pad needs more decoration/color, though, so I've been begging him to let me make him a quilt for his living area. Thus, the beer bottle quilt was born. My husband actually designed the quilt, and my brother got on board, so I had to make it, right? 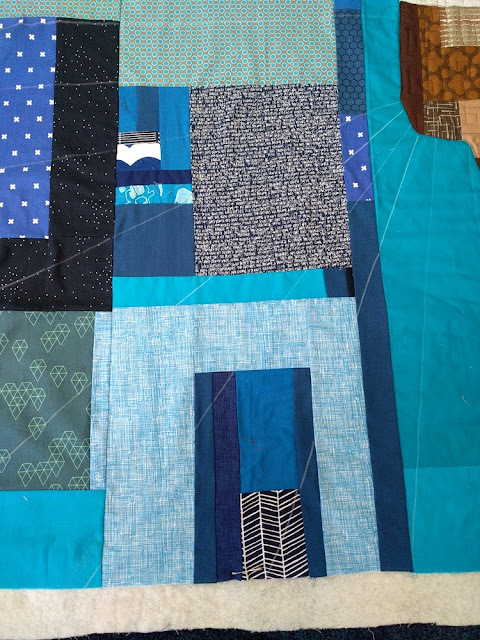 I sewed most of the quilt at our guild's November retreat - a great time to make distinct progress on projects. I pieced the beer bottle together using my favorite piecing technique, brick by brick improvisation. My friends Jess, Shannon, and Maggie helped me determine when the label and beer bottle actually looked legitimate. Never did I think I'd spend so much time thinking whether or not a beer bottle label was large enough (I'm not a beer drinker myself). Then, I appliqued the now-cut bottle onto a previously improvised blue background (blue is Sean's favorite color). I quilted the beer bottle in a quick, fun square motif using Aurifil 2360 (brown) and 2024 (white). After that, I had to figure out how to quilt the background. 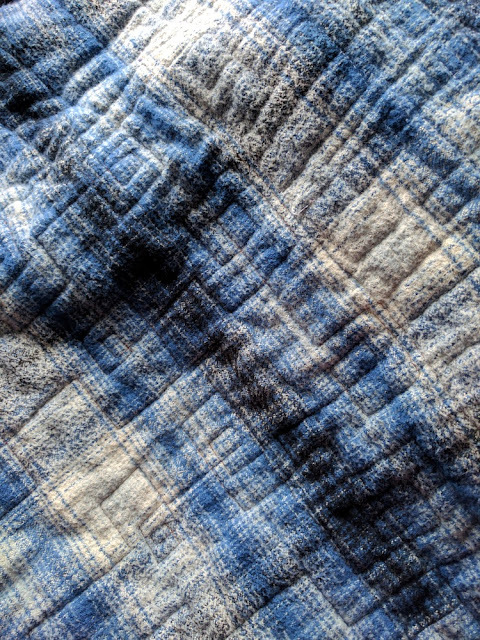 I wanted the quilt to be extra cuddly (the backing is Mammoth Flannel by Robert Kaufman - below) and not as densely quilted, so straight lines seemed to be a good idea. I decided to use Aurifil 2735 (a pretty medium blue) to blend in, but that was the easy part. What to quilt? Then, somehow the idea came about to highlight the beer bottle with diagonal lines (almost like a product being showcased in a commercial) rather than just vertical or horizontal lines in the background. It's definitely an unexpected element, but I love it! 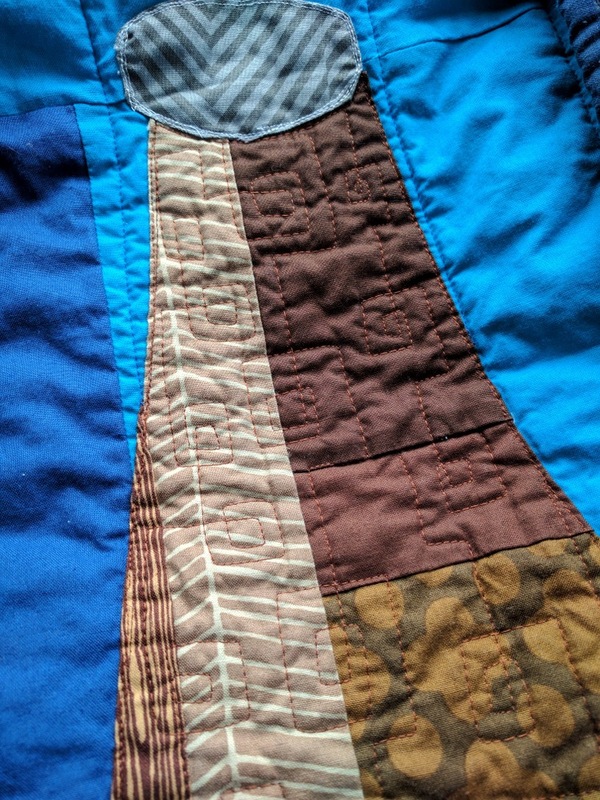 I used my quilting ruler and Fons and Porter chalk pencils to mark the lines, and then just quilted over them with my walking foot. So easy. Sean left me a 5-star review: "Just because she's my sister, that doesn't mean I have to like her, but this quilt is top quality. I like beer, and I like quilts. What else is there to say? As a non-quilter and a craft beer enthusiast, this is the best combination I could ask for." (He laughed through this entire review). 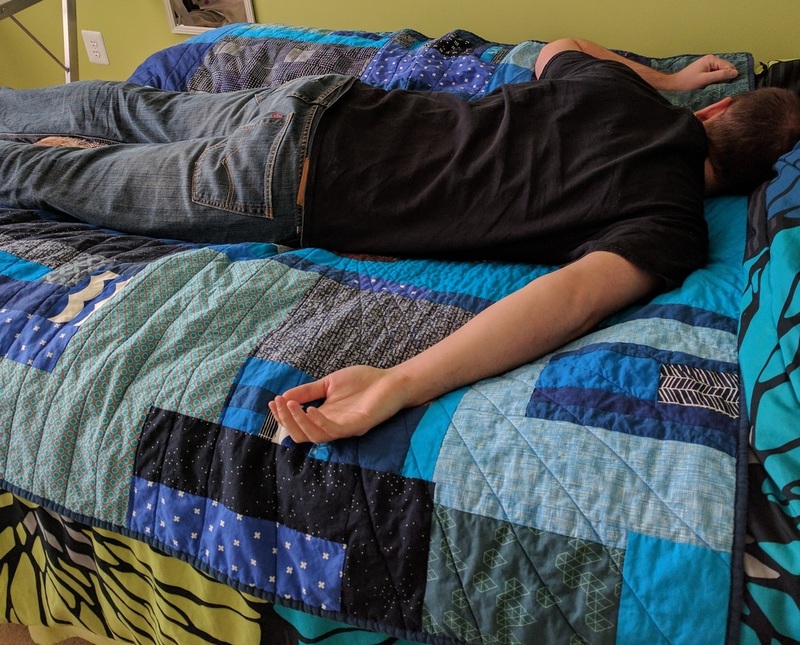 When he came home for the weekend and saw the quilt laying on the guest bed, he immediately took advantage. :) It's been a while since I made a super custom quilt for someone; it was a really fun project to engage in over the last few months. It's even extra long to accommodate his 6 foot+ frame (now you can estimate how large the beer bottle itself is - it's huge!). 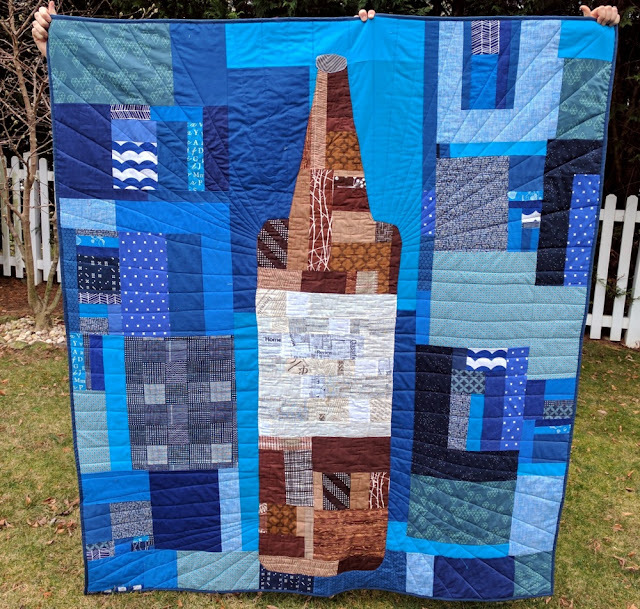 This will probably be the only beer bottle quilt I ever make! Oh I love this Jess - sounds just perfect for your brother and would be perfect for my husband. Never in a million years would I have thought of an improv beer bottle quilt - genius!! LOVE this!! Craft beer is my jam and this is giving me some ideas. So good! What a great sister! And I love how much thought went into the beer bottle label!! Very funny! This is great quilt and an even better quilt tale! I too have made my brother a t-shirt quilt... it's like the quilt everyone makes for their brother! 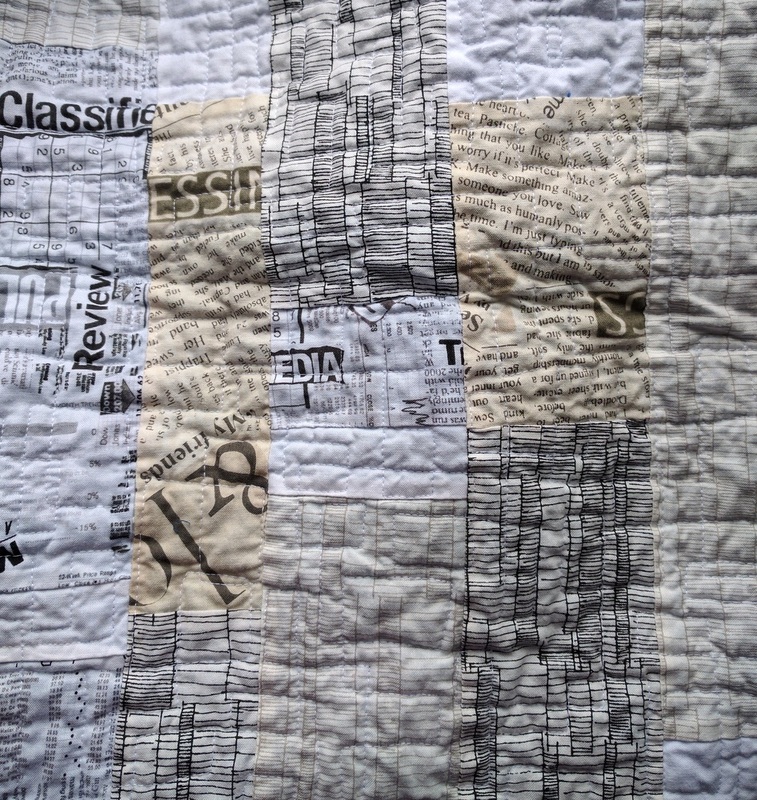 :) The rays of quilting are unexpected and just right for the finished creation. Thank you for linking up with TGIFF @ A Quarter Inch from the Edge! Love this quilt! It's so sweet that you made him a quilt that highlights what he likes. Great post & great quilt, what an awesome sister!